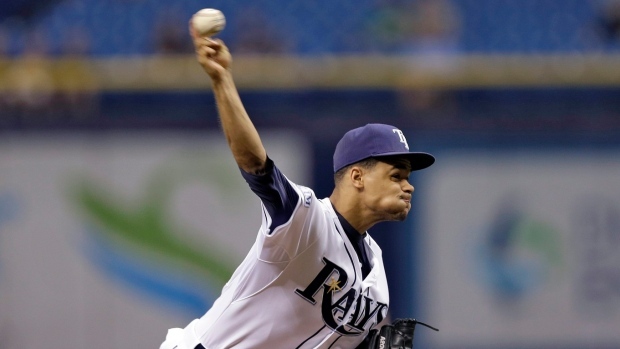 ST. PETERSBURG, Fla. - Chris Archer didn't need much run support for the struggling Tampa Bay hitters. Archer allowed three hits in 6 2/3 innings, Kevin Kiermaier and Evan Longoria homered on consecutive pitches, and the Rays beat the Houston Astros 5-0 on Thursday night. "Tonight he was dominant," Tampa Bay catcher Ryan Hanigan said of Archer. Archer (4-4) struck out eight and walked two to help the Rays win for the sixth time in the last 23 games. "It makes a huge difference when you're pitching ahead," Archer said. "Just getting strike one is key and that's what tonight was proof of." Three Tampa Bay relievers completed a three-hitter, sending Houston to its fourth straight loss. Kiermaier hit a two-run homer before Longoria had a solo drive off Paul Clemens in the seventh. Collin McHugh (4-5) gave up two unearned runs and four hits over six innings on his 27th birthday. "He's got weapons," Tampa Bay manager Joe Maddon said. "He's got know-how too." The Rays took a 2-0 lead in the fourth on Yunel Escobar's run-scoring single and a bunt by Hanigan. Tampa Bay got a break when shortstop Jonathan Villar dropped a throw on Brandon Guyer's potential double-play grounder after a leadoff single by James Loney. "You look at the quality of pitches he was throwing at that point, he pretty much was in control of the game," Astros manager Bo Porter said. "It was a groundball, double-play ball that we end up not recording a single out. Now it turns it into a pretty stressful inning." Jose Altuve opened the Houston fourth with an infield single and swiped second, but was left stranded. The Astros also failed to score during the sixth when Altuve singled and stole his AL-high 26th base. One day after loading the bases with no outs in the first inning and not scoring in a 2-0 loss to Baltimore, the Rays failed to capitalize during the opening frame Thursday despite having runners on first and third and no outs. McHugh struck out Kiermaier and Longoria before getting a comebacker from Loney. Ben Zobrist, 1 for his last 37 with runners in scoring position, popped out, Kiermaier struck out and Longoria hit a liner to third after the first two Rays drew walks in the third. "We had plenty of opportunities early," Maddon said. "It finally kicked in late." NOTES: The Rays placed OF David DeJesus on the 15-day DL with a broken left hand. DeJesus expects his hand will be in a splint for three weeks. ... Guyer (broken left thumb) was activated from the 15-day DL. ... Tampa Bay RHP Jeremy Hellickson (elbow) will need at least one more minor league start. Hellickson has made three rehab starts, including the last two at Triple-A where he has allowed 11 runs and 18 hits over a combined five innings. ... Houston RHP Brad Peacock, (food poisoning), Saturday's scheduled starter, rejoined the team. ... Rays LHP David Price (5-6) and Astros RHP Jarred Cosart (6-5) are Friday night's starters. Cosart beat Price, the reigning AL Cy Young Award winner, in his big league debut last July 12.